This accomplishment boggles the mind. 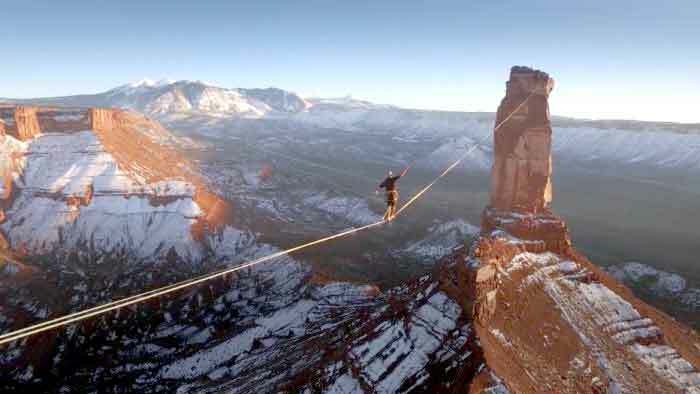 On November 15, 2015, Théo Sanson walked nearly 500 meters on a highline rigged from The Rectory to Castleton Tower in Castle Valley, Utah. The walk likely set a new world record. If you have tried slacklining, you already know it’s not easy. As the line gets longer, more difficulty arises. In this walk, Sanson had to overcome both the instability of the line from side to side and sag in the line due to its tremendous length. It was filmed and edited by Tim Kemple, Renan Ozturk and Anson Fogel.